Apple has just opened one of its most magnificent products, but it's not an iPhone: it's actually an Apple Store, and this one is an architectural masterpiece situated in the center of one of Europe's most picturesque places, the Piazza Liberty in Milan, Italy. The Piazza Liberty Apple Store is a masterpiece of modern glass design with a futuristic glass cube interpretation, similar to the 5th Avenue Apple Store in New York, but with a cascading fountain on the glass walls, so you feel like you are walking through water when you enter and with a massive hall underneath where you can shop for your favorite Apple gadgets. 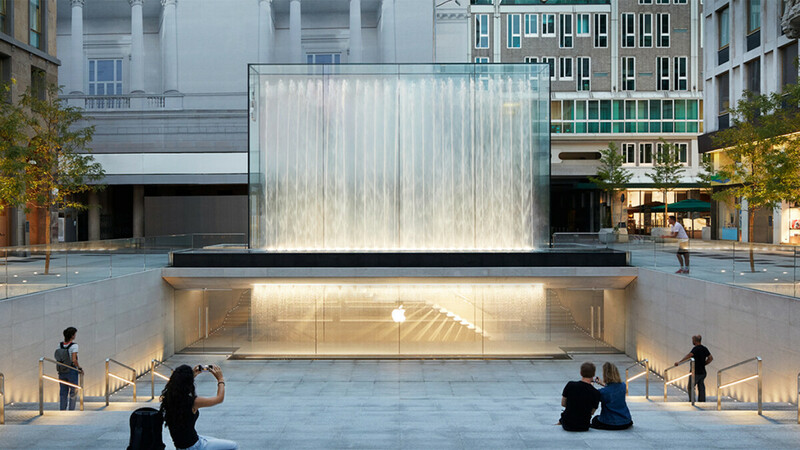 “We combined two fundamental elements of the Italian piazza — water and stone — adding a glass portal that creates a multi-sensory experience as visitors enter the store through a cascading fountain that seems to envelop them,” Apple chief designer Jony Ive said. "Just off the Corso Vittorio Emanuele, one of the most popular pedestrian streets in Milan, visitors will first see a dramatic glass fountain that serves as the entrance to the store and a backdrop to the large outdoor amphitheater. The piazza, clad in Beola Grigia, a stone used throughout Milan, is open to the public 24 hours a day and will host special events year-round amongst 14 Gleditsia Sunburst trees planted in the area," Apple adds in an official statement. And the new Milan Apple Store is a place that perfectly embodies Apple's spirit at the cross-section of technology and the arts. The venue will host various "Today at Apple" events with free sessions dedicated to mastering photography, film-making, music creation and much more. Some 230 Apple employees will help visitors at the Piazza Liberty Store, with many of them coming from various places in the world. The first month of the launch of the new store will be celebrated with special events and with local artists performing there. This new store brings the total number of Apple Stores in Italy to 17. And right below, you can see a video of this magnificent new Apple Store. Agree with you. I'm not an Apple customer, but admit that their ideas are great. Design is everything in Apple products. Not that they are not good, but from the design point of view - no one can match them. And all Samsung is doing are cheap jabs at iPhone. When you got the bucks to burn, why not. Honestly I'd expect no less considering the name was built largely on uppity 'tudes. It's their thing.